Robots from FIRST® Robotics Team #810 from Smithtown High Schools East and West and Team #3171 from Westhampton Beach Senior High School attempt to score points during a match of the FIRST POWER UP™ challenge at the Seventh Annual Half Hollow Hills Invitational at Half Hollow Hills West High School in Dix Hills on October 6. 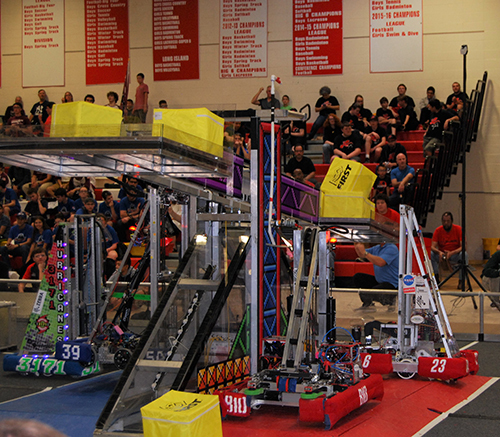 Now in its seventh year, the FIRST® (For Inspiration and Recognition of Science and Technology) Long Island Half Hollow Hills Invitational has become a staple of the local FIRST Robotics Competition season. This year’s event featured 17 teams, which competed using the robots they built for the 2018 SBPLI Long Island Regional FIRST® Robotics Competition that was held in April of this year. The challenge was dubbed FIRST POWER UP™, a game where the players are stuck in a video game and battle to defeat the BOSS. Real life robots battled on a 27-foot-by-54-foot playing field and earned points by accomplishing set tasks. Some of the goals included traversing obstacles and climbing the tower – which resulted in extra points. The event’s conclusion marks the start of the 2019 FIRST season and the 20th anniversary of the FIRST Robotics Competition SBPLI Long Island Regional. The Invitational is designed to showcase the benefits of robotics programs and STEM (Science, Technology, Engineering and Mathematics) education to students, schools, communities and local businesses.